One of the main anthropogenic causes of death for fin whale (Balaenoptera physalus) and sperm whales (Physeter macrocephalus) in the Mediterranean Sea is represented by collisions with boats. Every year, 220,000 ships greater than 100 tons cross the Mediterranean basin and approximately 30% of international sea-borne volume originates from or is directed towards 300 Mediterranean ports. These numbers are expected to increase. The Corso-Ligurian-Provençal basin alone is crossed daily by more than 9,000 vessels, ranging from cargo ships, hydrofoils, ferries, speed boats, whale watching boats, fishing vessels, military ships etc. The probability of collision depends on the type of boat. The vessels most often involved in accidents with large cetaceans are usually those covering long distances, like ferries, cargos and cruise ships. These vessels often navigate with the autopilot, day and night. Fig. 1. 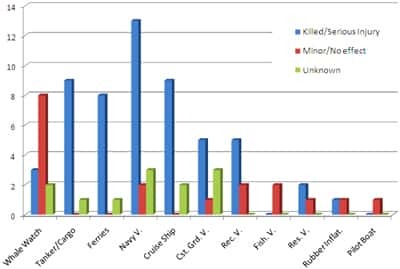 Number of ship strikes with fin whales by type of boat and type of injury (n=58; from Laist et al. 2001). Fig. 2. 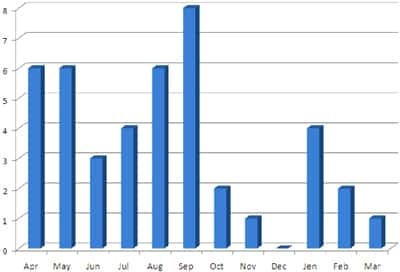 Monthly frequency of lethal collisions. Data were collected between 1972 and 2001, for a total of 43 fin whales. 33 collisions were reported between April and September, while 10 occurred between October and March (from Panigada et al. 2006). The greatest number of accidents occurs during the summer months, when maritime traffic, in particular of ferries and private boats, reaches its peak. As whales are not detectable by radar, chances to detect their presence is rather low. For this reason, at least during the day, it is important to have at least one observer scanning for cetaceans on the track line, to inform and alert the Captain and prevent hurting the animal. In addition to the risk of collisions, the intense maritime traffic is responsible for problems including pollution, noise and habitat degradation. In the Mediterranean Sea the two species of cetaceans most threatened by collisions with speed boats, cargos and ferries are the largest ones: the fin whale (up to 24 m in length) and the sperm whale (up to 18 m). These animals, like all cetaceans, come to the surface to breathe and may remain at the surface for long periods of time. This behavior, coupled with the large size which slows their reaction time and movements, is among the causes that make these two species more vulnerable to collisions. Even if these animals are particularly large, heavy ships may not realise when a collision occurs. Sometimes crews do not report such accidents, and therefore not all collisions are recorded. Cetaceans often do not survive or present serious injuries. However, a collision can also affect the ship and its passengers. Large tonnage vessels are not particularly at risk and an impact with a cetacean may not be acknowledged, however a collision event may be dangerous for small vessels. Developing and adopting mitigation strategies to reduce the risk of collision does not only protect cetaceans, but it also serves to ensure the safety of mariners. Dobler J.P. 2002. Analysis of shipping patterns in the Mediterranean and Black seas. CIESM. Alien marine organism introduced by ships in the Mediterranean and Black seas. CIESM Workshop Monographs 20:19-28. Laist D.W., Knowlton A.R., Mead J.G., Collet A.S., Podestà M. 2001. Collisions between ships and whales. Marine Mammal Science 17(1):35-75. Panigada S., Pesante G, Zanardelli M, Capoulade F., Gannier A., Weinrich M.T. 2006. Mediterranean fin whales at risk from fatal ship strikes. Marine Pollution Bulletin 52:1287–1298. SCOT. 2004. Etude du trafic en Méditerranée nord-occidentale. Rapport DT/TRA/03-363. Carcasses of 287 fin whales, found stranded along the coasts of the Mediterranean or adrift, were examined. 46 individuals (16%) died after a ship strike event. Between 1972 and 2001, 43 fatal strikes involving fin whales were reported, with an average of 1.43 animals per year. We also analyzed a sample of 383 photo-identified fin whales, with 9 animals (2.4%) presenting scars directly related to a collision. These numbers raise concern, considering that only a percentage of the collision events is reported and that often animals hit and killed in offshore waters sink without possibilities to be found and reported. These numbers are clearly an underestimate and the numbers of fin and sperm whales killed or injured by collisions are actually many more. Compiling and updating a database with collisions data occurred in the past is therefore very important to have a more realistic estimate of the actual number of collisions and the impact they may have on the populations of cetaceans living in the Mediterranean Sea. The analysis carried out throughout the Mediterranean also show that the Corso-Ligurian-Provençal basin, the Gulf of Lions and adjacent waters present the highest risk of collisions (Fig. 3), since the majority of reported accidents have occurred in this area, encompassing the Pelagos Sanctuary for marine mammals. Fig. 3. 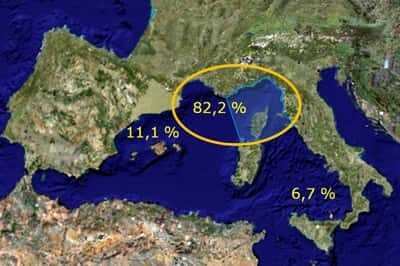 Percentage of collisions in the different areas of the western Mediterranean Sea (from Panigada et al. 2006). Fin whales concentrate in high numbers in the Pelagos Sanctuary in spring and summer, when they feed on large swarms of Mediterranean krill (Meganyctiphanes norvegica), which is particularly abundant in these waters. The presence of this feeding ground for fin whales in the Pelagos Sanctuary was one of the reasons leading the Tethys Research Institute to propose the creation of a marine protected area (MPA), that later became the Pelagos Sanctuary. The main source of data regarding ship strikes and sperm whales is the Pelagos Cetacean Research Institute, which operates in Greece since 1997. Estimates indicate that, on average, 1.4 sperm whales per year strand along the shores of Greece and 70% of them show clear signs of a collision. Scars caused by impacts with boats are also frequent in live animals sighted in the Ionian Greece and in the western Mediterranean (Strait of Gibraltar). The Strait of Gibraltar is one of the Mediterranean areas with the greatest abundance of cetaceans, including sperm whales. Due to the heavy traffic in this area, sperm whales are often injured and/or killed by collisions. Precautionary measures to avoid possible accidents have been proposed: these strategies – approved by the Ministry of Defense and the Spanish Ministry of the Environment – invite the crews to pay special attention when crossing high risk areas, maintaining low speeds. Frantzis A., Swift R., Gillespie D., Menhennett C., Gordon J., Gialinakis S. 1999. 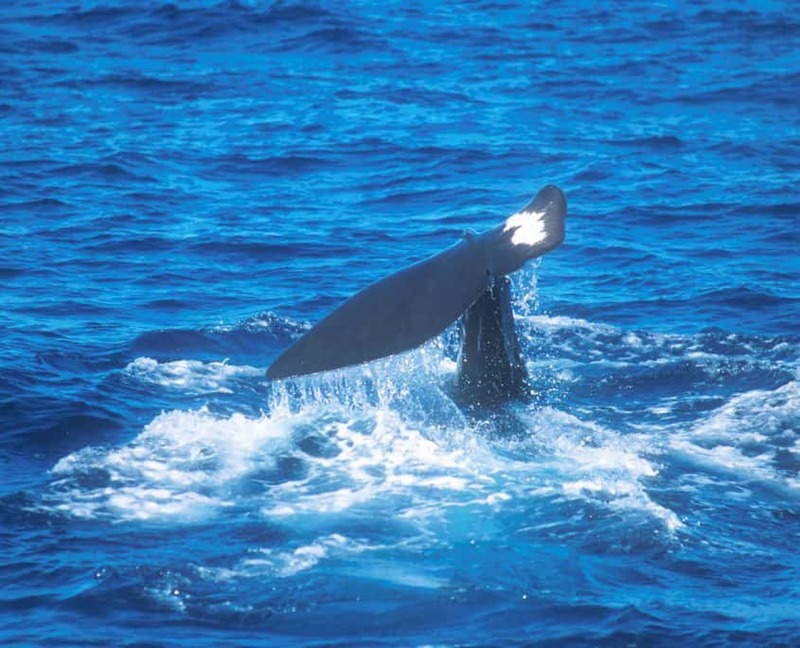 Sperm whale presence off south-west Crete, Greece, western Mediterranean. European Research on Cetaceans 13:214-217. Notarbartolo di Sciara G., Agardy T., Hyrenbach D., Scovazzi T., Van Klaveren P. 2008. The Pelagos Sanctuary for Mediterranean marine mammals. Aquatic Conservation: Marine and Freshwater Ecosystems 18:367-391. Considering that fin and sperm whales worldwide are listed in the IUCN Red List (International Union for Conservation of Nature), as Endangered and Vulnerable, respectively, the problem of collisions is even more serious. The sperm whale population in the Mediterranean Sea is considered Endangered, while available data on Mediterranean fin whales are insufficient to determine their regional conservation status (Data Deficient). Both fin and sperm whales spend their entire life cycle within the Mediterranean basin with limited exchanges with specimens from the North Atlantic, and they belong to genetically isolated populations. It is therefore essential to take appropriate conservation strategies to ensure the long-term survival of these animals. Notarbartolo di Sciara G., Zanardelli M., Jahoda M., Panigada S., Airoldi S. 2003. The fin whale, Balaenoptera physalus (L. 1758), in the Mediterranean Sea. Mammal Review 33(2):105-150. Reeves R., Notarbartolo di Sciara G. (compilers and editors). 2006. The status and distribution of cetaceans in the Black Sea and Mediterranean Sea. IUCN Centre for Mediterranean Cooperation, Malaga, Spain. 137 pp.